WARNING! Rock Climbing, Mountaineering and Skiing are, by their very nature, potentially hazardous activities. The information presented here is intended as an adjunct to, not a replacement for, sound judgment and experience. The accuracy of the information presented cannot be guaranteed and may change with time. The onus is on the individual to verify the applicability of the information to a given time and environment before using it as the basis of any kind of decision. In addition, accurate knowledge of the use of various safety devices and systems is requisite to understanding the information presented and in determining it's applicability to your situations. Always use a backup to your systems where a failure could result in death or injury. Nature offers few second chances for poor or inappropriate application of information and techniques. The Law of Gravity has no Court of Appeal. This must not be your only source of information on any given climbing route or subject. Seek additional information from guidebooks, reputable climbing schools, mountain guides, local climbers, Park Wardens and Rangers. Common sense and a strong will to survive must pervade your thoughts and actions. By using the information contained here, you are releasing the authors and Rescue Dynamics from any liability for any injury, including death, that may occur. You have been warned. Before you head out, check the Current Conditions Page for beta on what has been happening. Then check the weather on our constantly improving super weather page: Weather Forecasts for Canada - All on One Page. Morro Bluffs is a convenient little crag situated close to Jasper. It's in a lovely spot overlooking the Athabasca river. Matt Reynolds has been very busy updating this old practice area during the spring and early summer of 1999. He has bolted about 9 routes and / or variants on the North facing bluff visible from Morro slabs. The word on the street is that these are fun routes and the bolts are closely spaced so you can get out on the rock without much worry about decking out. The information on Morro Bluffs below is courtesy of Matt Reynolds. The activity at this crag was minimal until 1999. Prior to that time a few folks like Willie Pfisterer, Hans Schwarz, Cyril Shokoples and one or two others had done some traditional climbing there, but not much of note. A few VERY old bolts were in existance in the late 1970s and should be viewed with suspicion if found. 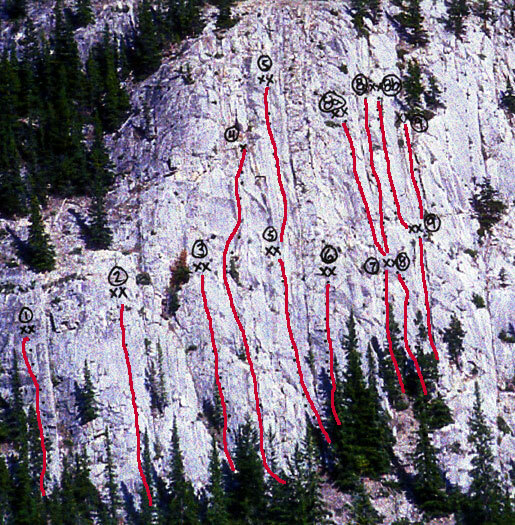 The bluffs now sport several routes 1 and 2 pitches long between 5.6 and 5.9. Most routes are well bolted, making it a great spot for beginners and climbers learning to lead. Typically this area is very dry, although it can see some high winds. All climbs are equipped with rappel anchors and all rappels can be made with a 60m rope. It is not a convenient area for top roping. A major concern with climbing at this area are the bighorn sheep. No serious incidences have been reported yet, however stonefall from the wild life is a given if they are around. The cliff has been home to Bighorn sheep long before climbers came, remember that we are the intruders!!! Backing off of a climb to give the sheep their space is not unheard of. WEAR YOU'RE HELMET!! Park at he Morro Peak parking lot 20km east of town. The Overlander trail starts here. Follow the Overlander trail for about 5 to 10 min. There will be a smooth rock with a plaque in memory of Geo L. Jones. Only 50m past this rock is a trail that climbs steeply left. Follow this trail for 5 minutes until another worn trail branches right and traverses the base of the cliff. 15 minutes from the road.